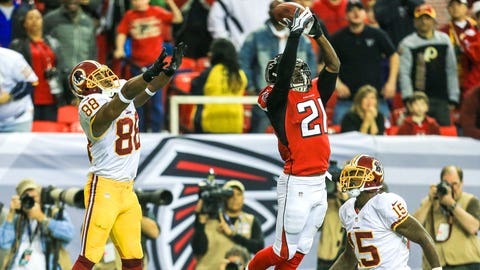 Falcons corner Desmond Trufant deflected the game-winning two-pointer out of bounds on Sunday, thwarting the Redskins' last-minute attempt at victory. ATLANTA — Last week, Falcons head coach Mike Smith didn’t think any tension existed between the teamâs dual goals in the last few games of the season, giving young players game experience while also trying to win. "Thereâs going to be a learning curve," Smith said on Monday. "We say it all the time with these young players: Weâre getting experience with on-the-job training with a lot of guys in the last quarter of the season. I think it’s going to pay dividends for us moving forward. Weâre going to be able to determine who can play and theyâre going to be put in a lot of different situations." Smith cited one stretch of about nine minutes â starting with 48 seconds left in the first quarter and ending with 6:35 left in the second â in which the Falcons allowed four plays for roughly 150 yards of explosive plays. Smith said while other plays were sprinkled in â this was the sequence when the teams traded fumbles on three consecutive plays â that those four plays were almost consecutive. "A lot of it is youth," Smith said of the reason behind the explosive plays. "There were two specific plays that were on two of our guys and then the touchdown pass after the explosive run was on one of our young guys. I’m not going to call them out specifically. "We had no chance on the touchdown pass after the explosive run. It was kind of what we call a ‘fubar.’ It was not lined up correctly, didnât have a chance. We had three young guys back there and they had a little bit of an issue getting lined up on that specific play." The situation was especially acute in the secondary. Seventh-round pick Zeke Motta started in place of injured safety Thomas DeCoud (concussion), second-round pick Robert Alford started in place of Asante Samuel at left cornerback and first-round Desmond Trufant â who has started all season â was a third rookie in the defensive backfield. Motta struggled to line up correctly on a 23-yard touchdown reception by tight end Fred Davis, which followed Alfred Morrisâ 37-yard run with 48 seconds left in the first quarter. "A lot of it had to do with eyes and looking where you’re supposed to be looking," Smith said. "There were teaching moments where if youâre getting beat on a double cut, if youâre going to hold the (receiver), make sure you hold him good where he doesnât get the opportunity to still catch the football. You take the five-yard penalty on a defensive holding and those are all things our young guys are going to learn. There were some run fits that hurt us on the explosive run in terms of the rotation, the technique we used on a long run so they’re all learning opportunities for our guys." "Youâve got to be patient," he said. "Look, those guys are out there, theyâre trying their hardest. Theyâre giving their effort. Our guys have not lacked effort all season long. Itâs really been about execution. As a coaching staff, you have to make those adjustments at halftime and you have to talk to the guys about how weâre going to do it better the next time we have an opportunity to be put in that situation. Yes, you’ve got to make some subtle adjustments. "More times than not, most of the adjustments are made on Wednesday, Thursday and Friday (in practice). If youâre going to get after them and yell at them, Iâve found itâs better to do it on Wednesday, Thursday and Friday. You want to be supportive. Thatâs a hard, physical, mentally tough game that those guys play and you want to be as supportive as you can as a coach and as a coaching staff." Smith offered mixed messages on the health of linebacker Sean Weatherspoon (knee), though he said he was optimistic Weatherspoon could return for Mondayâs game at San Francisco. "As coaches, you don’t want to have those negative learning situations,â Smith said. âYou want to have positive learning situations and weâve had way too many negative learning situations in this ballgame and the entire season."